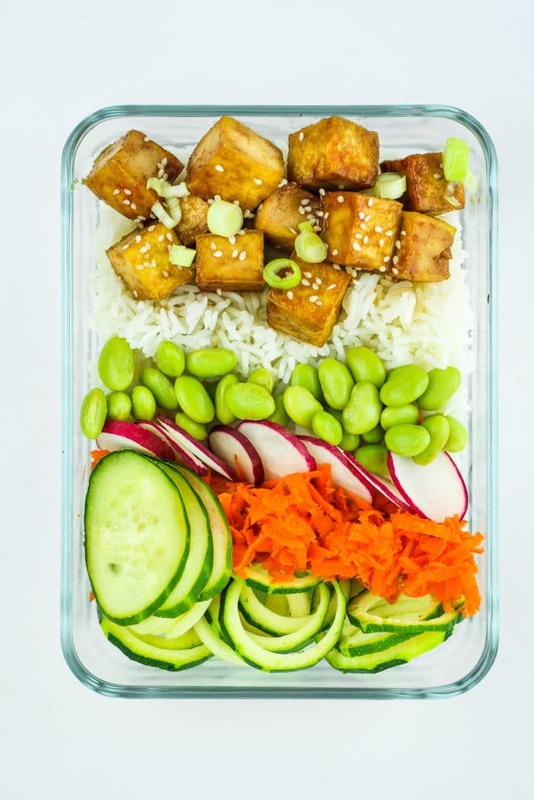 This tofu poke bowl recipe is made with bites of sweet and spicy tofu, fluffy white rice, and a rainbow of fresh vegetables. It’s an awesome vegan meal prep recipe and it’s so easy to make! More meal prep! Are you loving it? Or are you sick of it? I keep getting requests for more meal preppable recipes, so I’m gonna deliver! What’s cool about recipes like these tofu poke bowls is that they’re not just for meal prep. They’re also an awesome, healthy lunch or dinner option! 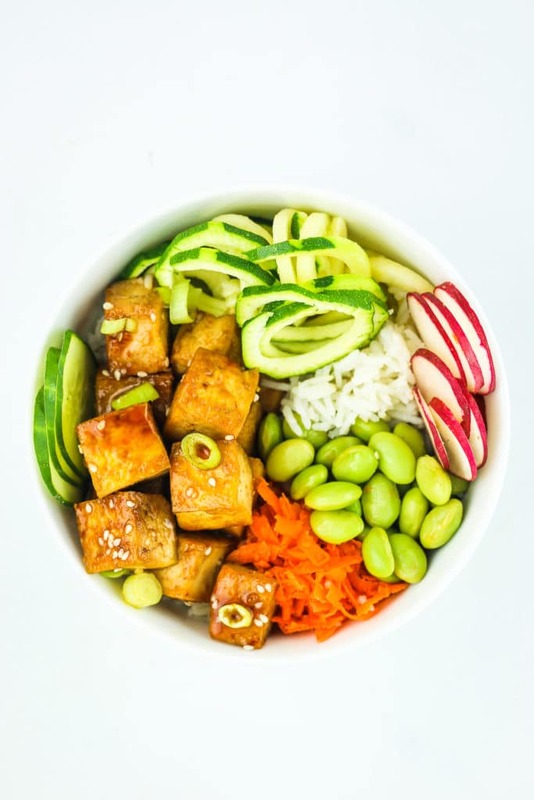 A poke bowl is essentially a big bowl of veggies, rice, protein, and a sauce. Typically, fish is the main protein component of poke bowls. But if you’ve gotten this far, you already know we’re using tofu instead and it’s SO simple. 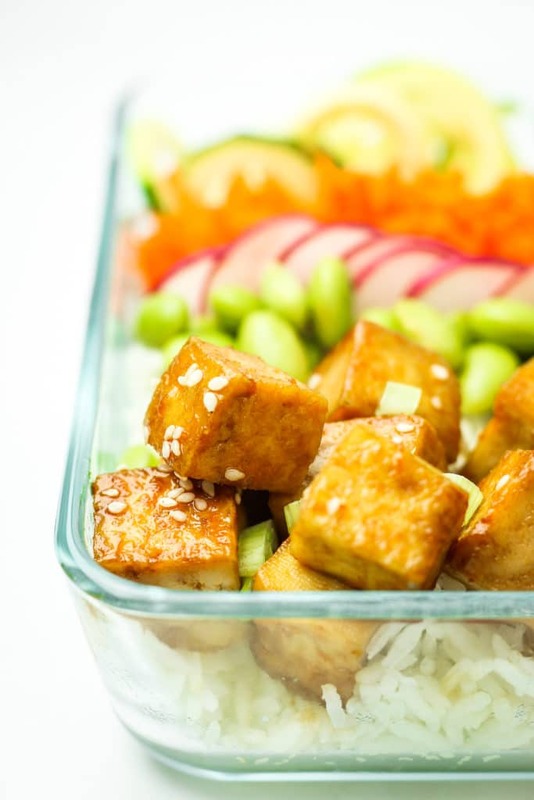 ‍♀️ The tofu gets marinated in a sweet and spicy sauce, then sautéed for 15-20 minutes until it’s nice and crispy. While that’s cooking you can make your rice – I used jasmine rice, but you can use any grain you like, or omit. As far as actual cooking time, that’s it! The rest of the process is just prepping your vegetables and other ingredients. This recipe is super customizable – you can tailor it depending on your favorite veggies, or what’s in season, or what’s left in the fridge. I used spiralized zucchini, thinly sliced radishes and cucumber, shredded carrot, and edamame, plus a few scallions. I love to include spiralized veggies because I’ll take any excuse to use my spiralizer. But you can chop your ingredients however you like and you can use whatever ingredients you like! Drain tofu of excess liquid and press to remove as much as possible. Chop into cubes, about 1″ in size. In a mason jar or small bowl, mix together maple syrup, soy sauce, 1 tablespoon olive oil, and sriracha. Mix well. In a large nonstick skillet, bring 1 tablespoon of olive oil to medium heat. Add tofu cubes to the heated skillet and sprinkle with salt. Cook for 20 minutes, tossing every 5 minutes. (If the tofu starts to stick or break apart, add another drizzle of oil.) I try to rotate the cubes to get a little crisp on all sides! After 20 minutes, carefully pour in the sauce mixture, reserving 2 tablespoons for later. Stir to coat all of the tofu cubes and decrease the heat to low/simmer. Cook 5-8 more minutes to allow the sauce to thicken. Remove from heat and let cool. Now, prep your veggies! I recommend slicing, dicing, chopping, spiralizing, and even grating – the goal is to create lots of texture and flavors. 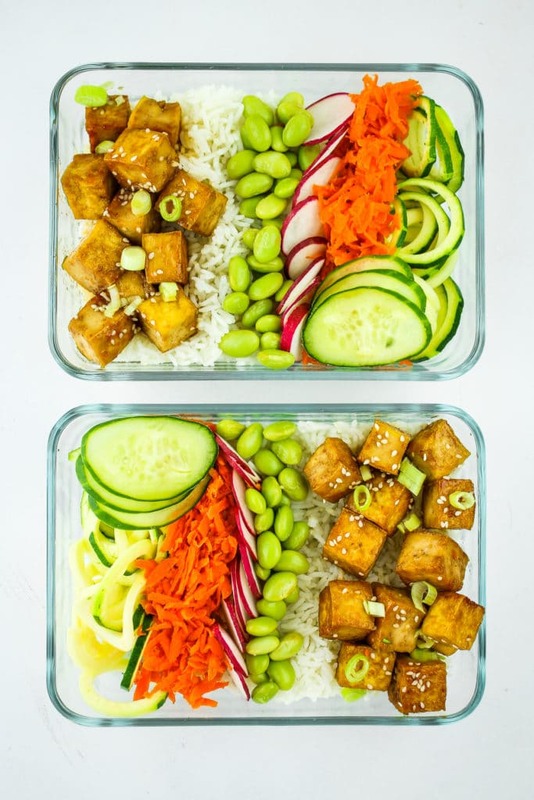 Layer a meal prep container or bowl with rice, then add tofu, then add your veggies and drizzle with remaining sauce. Enjoy! For meal prep, refrigerate up to 5 days. Use any veggies you like and prep them however you like! Red onion, avocado, bell peppers, tomatoes, broccoli, etc. 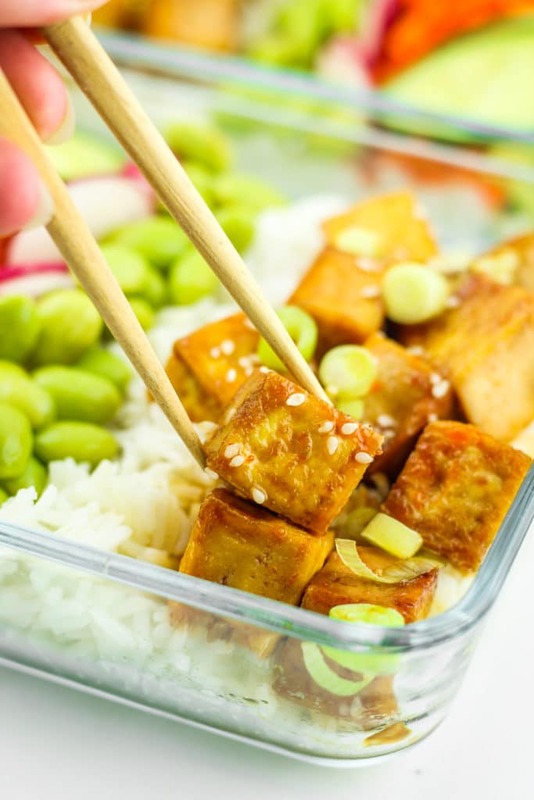 I’m not a tofu fan, but I’m totally making these with some marinated chicken and i bet it’s going to be amazing! I love a good meal prep! This looks so beautiful and so easy to make! This looks nice and healthy! My vegetarian friends would appreciate this recipe. Be sure to share with them! 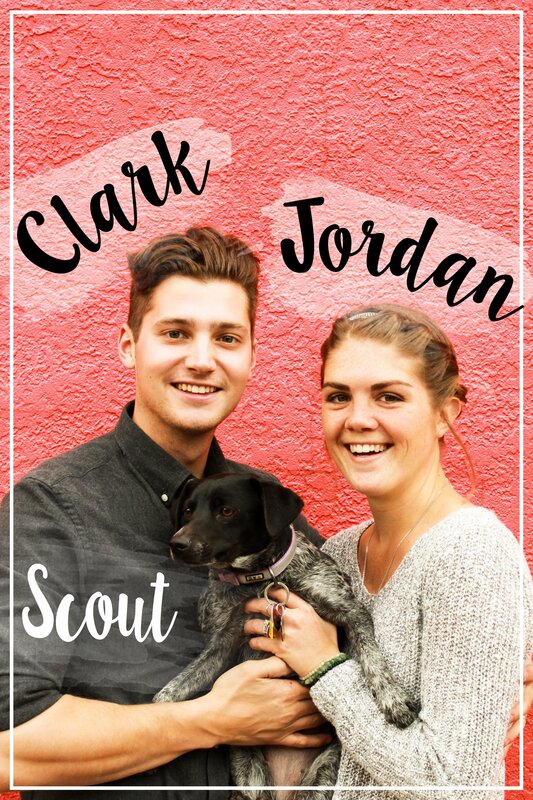 The hubs and I are really into meal planning and we need new recipes to change it up. I love poke bowls and this would be a great addition to our rotation! This dish is begging me to try tofu for the first time! I love the concept of a poke bowl so I just may have to give this a try. The sauce on the tofu looks amazing! OMG yes you’re going to love it! Oh that tofu is screaming my name! 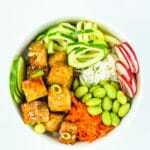 Love adding marinated tofu to different dishes, especially salads. Beautifully prepared and presented meal, would love this for lunch! I do too! It’s so versatile and delicious! This fits the crispy ticket for sure! Enjoy! I haven’t had a poke bowl since they became so popular because I’ve been pregnant – now I can give them a try! Even though we’re not vegan, I do love tofu. Especially when it’s in a yummy marinade and crispy. Oh gosh! You should definitely give this a try! This looks so healthy,flavorful and colorful. I love tofu in any form. Adding this in my to do list. Thanks for sharing. I would love that bowl to be my lunch! Love everything about it. Thanks for sharing awesome meal preps! You should definitely give these a try! They’re so flavorful! I really need to get into meal prep so I can eat like this at lunch. 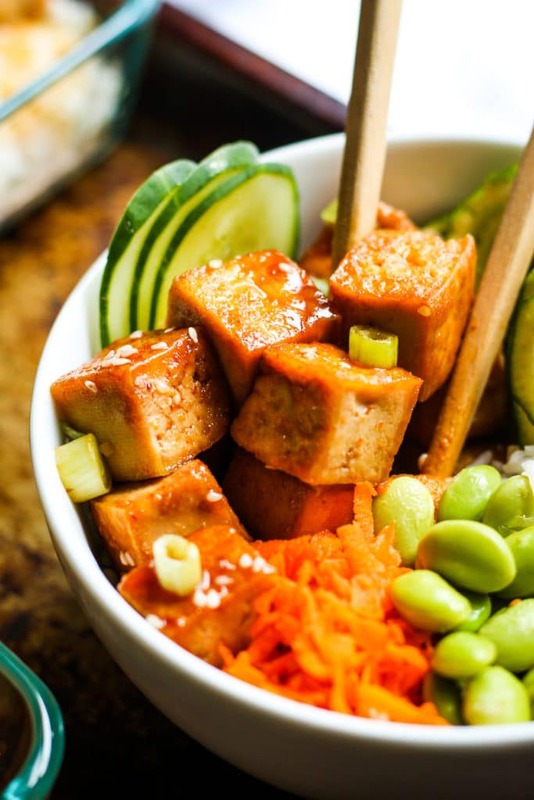 I am loving tofu lately and this is such a bright and flavorful meal! Yumm! Do it! It makes life so much simpler!